With 21mm of eye relief, the eyepiece provides extremely comfortable viewing. It means that you can still enjoy the whole field of view even when wearing glasses. And, finally, you can see the entire field of view without any annoying moving your eye around. With long focal length telescopes, there is little choice if you want low magnification. But how to still have a wide field of view? This has been achieved with the Astromania Plossl 56mm eyepiece. High quality observing with a telescope all comes down to using good quality eyepieces - these are just as important as the telescope itself. They decide whether you can see the fine spiral arms of M51, and be able to make out a minor planet that is right at the telescope's performance limit. They even reduce annoying internal reflections when observing bright objects. 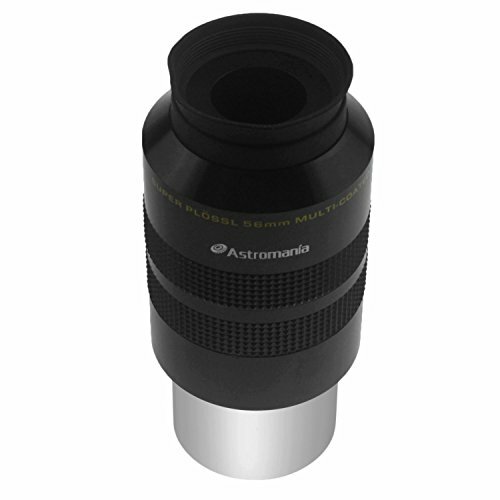 The edges of the lens elements in Astromania Super Ploessl eyepieces have been blackened in order to provide good contrast. The light does not 'get lost' on the way, but reaches exactly where it should - your eye. 56mm focal length for low magnifications and an excellent overview. 52 degree field of view - enjoy observing a large section of the night sky. Blackened lens edges and rubber eyecup for increased contrast. Multi-coating to prevent unwanted reflections. 2" eyepiece with 2" filter thread, a high performance at a low price.